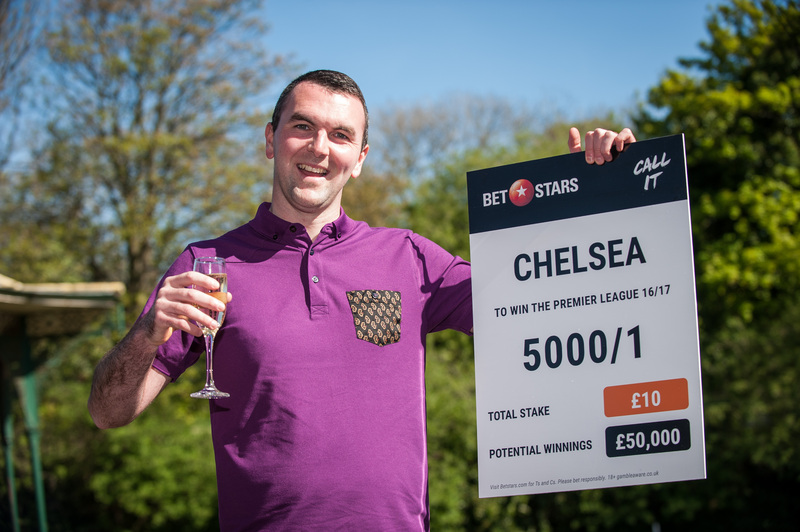 ONCHAN, Isle of Man – May 15, 2017 – UK postman Ben Scott, 26, of Roker, Sunderland, has won a “life-changing” £50,000 after odds on his £10 bet for Chelsea to win the Premier League title were enhanced to 5000-1 by online betting site BetStars, an Amaya Inc. (Nasdaq: AYA; TSX: AYA) brand. The Sunderland fan said the huge prize will be a “life-changing” amount of money for him and his partner Laura, who is a nursery nurse. Ben posted the bet before the start of the season and received promotional odds of 5,000-1 from BetStars, the same odds Leicester City overcame to win the 2015-16 league title. His original bet of £10 for Chelsea to be champions was placed against 5-1 odds and would have won him £50. He has now scored a whopping £50,000 thanks to the Blues winning the league on Friday (May 12) with a one nil victory against West Bromwich Albion. The Sunderland fan said he became “pretty obsessed” with keeping up to date with Chelsea’s play and has watched every single Chelsea match and all of Antonio Conte’s press conferences.